If you’re serious about your strength training, then you know that the power rack is one of the most important tools in any home gym. It allows you to go beast mode in your training – from squats to bench presses and more – without needing a spotter. Traditionally, power racks are tall – really tall. If you’re building a home gym, then finding a power rack for low ceilings can be a challenge. That’s where we come in – in this article, we’ve put together a list of the very best low ceiling power racks. These are high-quality racks that boast all the strength and stability of their full-sized counterparts but fit easily in your basement or garage. 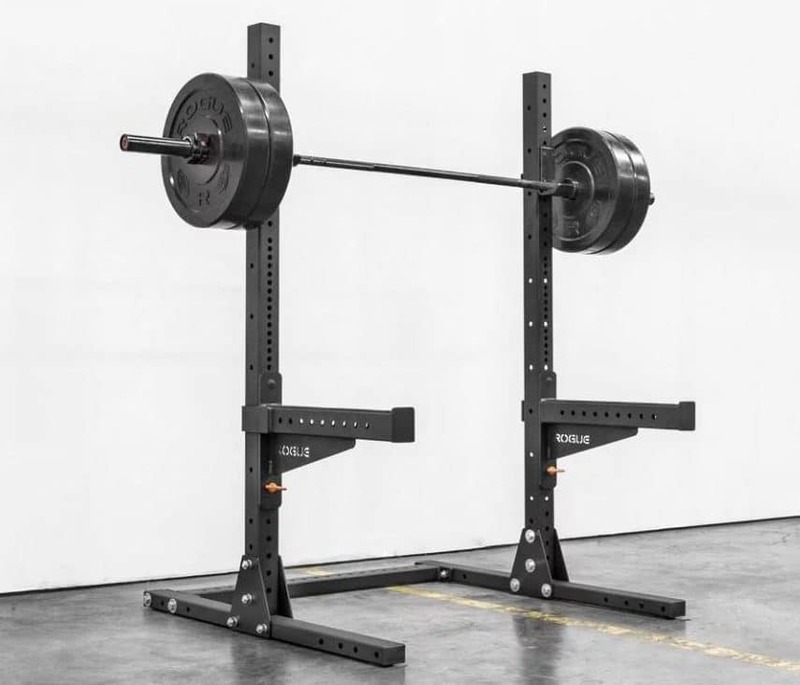 If you’re in a hurry, here’s a quick summary of our top 4 power racks for low ceilings in 2019. If you’re not familiar with a power rack, then let’s remedy that problem right now! So, what is a power rack? It may be called a squat rack, power cage, or squat cage, but a power rack is basically a piece of fitness equipment used for training with free weights. It works like a spotter – the rack catches the bar if you fail. And you can perform a ton of exercises on a power rack: bench press, overhead press, squats, shrugs, pull-ups, and more. Now that we’re all on the same page, let’s get into our picks of the best power racks for low ceilings. Are you a serious lifter who likes to throw around some serious weight? Then check out the Titan T-2 Short Power Rack – it boasts the highest weight capacity (700 pounds) of any power rack on our list. Get ready to get ripped! Measuring in at just 71.5” tall, the Titan T-2 Short Rack is short and stocky, making it stable enough for heavier weights. It features extended feet on the base to help with stability, as well as pegs to hold your weights and help balance out the cage to minimize wobbling. And with the Titan T-2’s high-quality, 11-gauge steel construction, you’re getting maximum durability for killer lifting sessions. The Titan T-2 Short Rack also gives you a lot of versatility, with 21 different bar positions. You can do squats, bench press, military presses, and more, allowing you to target muscles from all different angles. And the pull-up bar is actually a few inches below the top of the rack (at a 68” height), so you can get a full range of motion with your pull-ups. In short (pun intended), the Titan T-2 Short Power Rack is the best power rack under $500. Even top-level fitness buffs love this power rack. If you want to pack on maximum muscle without leaving your home, get the Titan T-2. This is an excellent budget-friendly option for a 6-foot power rack, ideal for garages or other rooms with low ceilings. The CAP Barbell Full Cage Power Rack is a solidly built cage with a flashy look – and it can be anchored to the floor for maximum stability. With a 500-pound weight capacity, this full cage power rack doesn’t mess around. It also offers decent durability with a mix of 12- and 14-gauge steel construction. While 14-gauge is typically what you see on the cheapest racks, this CAP Barbell power rack includes anchor holes on the frame for added stability. To maximize safety, this power rack includes two chrome mounted safety bars and two chrome lock-on safety bars, so don’t be afraid to load up that bar. We don’t love the pull-up bar on this power rack – it’s right at the top, making pull-ups a challenge in a room with low ceilings. But for a budget-friendly power rack, the CAP Barbell cage does not disappoint. In addition to all this, the CAP Barbell Full Cage Power Rack just looks badass! It’s available in several awesome color combinations and has a powder-coated finish. Take your strength training to the next level (and look good while doing it) with this low ceiling power rack. No room for a full power rack? Just because you’re limited on space doesn’t mean you have to skimp on your weight lifting. Check out this Powertec Workbench Half Rack – with a 1,000-pound weight capacity and a compact design, you can hulk out at home with no problem. This is our tallest power rack on the list, so if you’re looking for a short power rack for low, 6' ceilings, this isn’t it. But if you have 7’ ceilings, the Powertec Workbench Half Rack is an excellent option, as it comes in right at 82” tall. Another great benefit to a Powertec power rack is that it can be customized and expanded with different add-ons, such as the lat tower or multi-grip pull-up bar. You might also want to upgrade the spotter arms – the ones that come with the Powertec Workbench Half Rack are only around 8” long. For maximum safety, longer spotter arms are best, especially when you’re going for a new PR. While a half rack isn’t as stable as a full power cage, this quality piece of equipment has very little wobble, thanks in part to its heavy-duty construction. And you can use the pegs to hang your weights and help balance out the rack as well. The Powertec Workbench Half Rack is a great option for serious lifters with limited space. Rogue is known for its unsurpassed quality and construction, but unfortunately, there’s no Rogue short power rack on the market. So instead, we’ve found a different option – a 70” Rogue squat stand. While it’s not a full power rack, this little beast is worth a look. Made from 3”x3”, 11-gauge steel tubing, the Rogue SML-1 70” Monster Lite Squat Stand boasts durability and stability that few other racks in this price range can match. When Rogue says heavy-duty, they mean it – you can load this bad boy up with over 1,000 pounds of weight! And it’s very stable, despite not being a full power rack. When lifting this much weight, you definitely want to add the 24” safety spot arms, which are longer than average. This means you can lift heavy and train to failure without the need for a spotter. You can also add wheels for easy transport or brackets to bolt the frame down. It should be noted that you can’t do pull-ups on this squat stand (duh), but taller users may actually like the fact that there’s no pull-up bar to hit their head on. All in all, if you want a beefy squat stand that gives you all the strength and stability of a full power cage, then the Rogue SML-1 70” Monster Lite Squat Stand is number one the list. Q: How tall is the ceiling in a typical basement or garage? A: The average ceiling height in most homes and garages is 8 feet, although newer homes typically have higher ceilings. However, most basements have lower ceilings that are around 7 feet tall, which leaves little room for the average power rack. A 72” power rack is definitely your best choice for a basement. Q: How tall are power racks? A: On average, a full power rack is around 82” tall. However, many of the heavy-duty power racks, such as those made by Rogue, are a full 90” tall. That’s why these racks aren’t always an option for your home gym. But most of the power racks listed in this article are 6-feet tall or less. Q: Are short power racks safe? A: Yes! In fact, all power racks are designed to keep you safe, and they’re tested for balance and stability. So, as long as you use them properly (i.e. check the maximum weight capacity, use safety bars, etc. ), a short power rack is just as safe as a larger power rack. And they’re far more practical for at-home use. Q: Will I hit my head on the ceiling if I do pull-ups on a short power rack? A: This depends – both on your height and your ceiling height. You’ll need a little extra headspace if you want to go through the full range of motion in a pull-up so take that into consideration and don’t cut it too close (if you can help it). You can also look for a rack with a pull-up bar that’s set just below the maximum height – like the Titan T-2 Short Rack. Q: Can a short power rack be used by tall people? A: While a 6-foot power rack works great for low ceilings, it may be a nuisance if you’re close to 6-feet tall yourself. And it will definitely make pull-ups out of the question! If you’re on the taller side, you may want to consider a half rack or small squat rack instead. There are two on this list are ideal for any tall lifter that’s chasing those gains! Previous Post 8 Best Vertical Climbers for Home Gyms Next Post What is the Whoosh Effect for Weight Loss? Myth or Real?